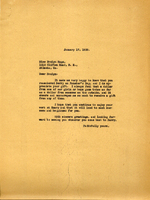 A letter thanking Mrs. Crowninshield for all her help over the past eleven years and informing of her some of the highlights at the school during that time and presently. Additionally, an invitation to come back and visit the school either on her way to Florida or on her way back. 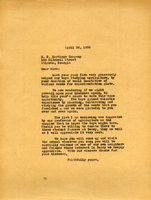 This is a thank you letter to Mr. Gilroy regarding Mr. Cox's $200 donation from his estate. 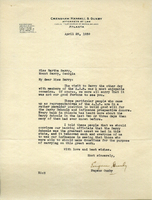 Martha Berry also invites Mr. Gilroy to visit the Berry Schools whenever he's in the area. 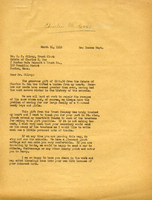 Martha Berry sends thanks for the gift and enclosed pamphlet from the United States Unit of Service of 'A Call to all Men and Women of Goodwill in all parts of the World' sent to her from Mrs. Cowl. Miss Berry goes on to describe the weather and happenings at Berry. A thank you letter to a student at Berry for their donation on Founder's Day. 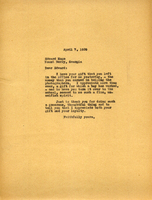 A letter thanking Edward for his donation of his money he earned helping photographers. 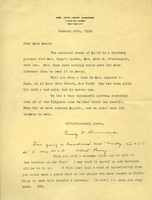 A letter to Mrs. Henry from Samuel Hill talking of his and his wife's visit to Berry earlier the month before and the promise of a donation in July. He is sending it earlier on the early attribution of $150.00. 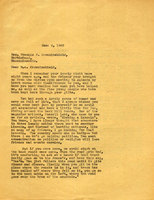 A letter informing Martha Berry that Mrs. Coonley can't donate to the Berry Schools this year because her budget is already fully planned. Martha Berry asks the company if they might be willing to donate seeds to help the boys studying agriculture. She enclosed a list of seeds that might be good for the boys to work with. She also says that she hopes they will come up and visit the school. 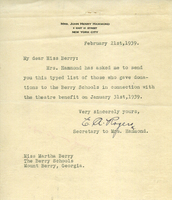 Miss Rogers, the secretary yo Mrs. John Henry Hammond, sends a note attached to a list of people who donated to the Berry Schools in connection with the theatre benefit. 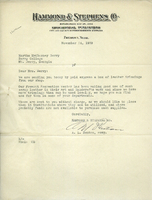 A letter informing Martha Berry of a donation of leather trimminge from their shop. Benton hopes that they can put it to use for projects that they otherwise would not be able to afford. 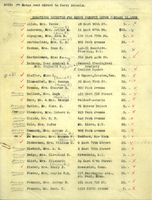 Mr. Gunby informs Martha Berry that he and his friends, who are representatives of A.I.B, have used their influence in order to encourage more wealthy patrons to donate to the Berry Schools.